Jesus said, "I am the light of the world. Whoever follows me will never walk in darkness, but will have the light of life" John 8:12. What you need: You will need white paper bags, markers or colored pencils, scissors, and a string of white lights. What you do: Children decorate their paper bag and write the above Bible verse on it. The children colored a picture of a lighthouse, from the patterns section of the curriculum, glued it to the bag, and then cut out the "window" so the light could shine through. We then hung the bags on a string of white lights and positioned the individual lights to shine through the windows. The children used their paper lanterns throughout the Lighthouse Lesson Plans to score their progress for Scripture memorization. 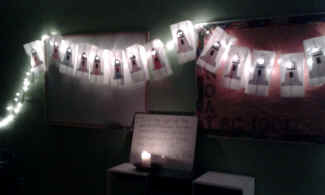 We placed the "Jesus" candle in front of the memory verse for Lesson One, "I am the light of the world. Whoever follows me will never walk in darkness, but will have the light of life" John 8:12. The candle was then used in "Spread the Light," one of the Bible memorization techniques found in Lesson One of the Lighthouse Lessons, an Overview of the Book of Acts. See it on Instagram too!